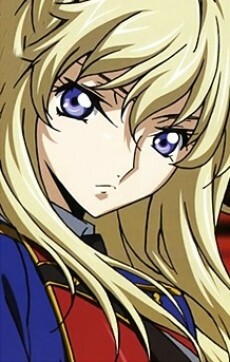 Leila Malcal (レイラ・マルカル) has very long, blond hair and light purple eyes. She also wears a peculiar E.U. military uniform. Leila is a former Britannian aristocrat and a military officer in the E.U. Army. She works under Gene Smilas and is Akito Hyuga's superior and the Commander of the W-0 Unit comprised of Japanese teenagers who recklessly plunge into a battlefield where the survival rate is extremely low. They fight for their freedom, so that they can have a country that they can return to that feels like “home”. Thus begins their fight against the adult world. Leila Malcal is the daughter of a Britannian noble family that disagreed with the dated system of rule in the empire, which made them defect to the E.U. as exiles. She was originally an adjutant to Commander Anou in the W-0 Unit during a military operation, but Leila confronted him over the use of Japanese youngsters for suicide attacks and finally removed Anou from his position. From the recent trailers and previews, it's hinted that Leila may possibly have some form of Geass.